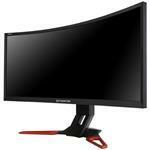 The Predator Z35 35" LCD Monitor from Acer is a feature packed monitor designed for gamers. It has an ultra-wide aspect ratio of 21:9 with a 3440 x 1440 resolution to match for high resolution content reproduction. It's built with a VA (Vertical Alignment) panel, which provides you with wide viewing angles and vivid colors. Combined with its 300 cd/m² brightness rating, 2500:1 static contrast ratio, and support for 16.7 million colors, you'll be able to enjoy accurate colors with darker blacks and brighter bright colors. The curvature of the display places you in the middle of the action for a more immersive gaming experience. Furthermore, it has a 100 Hz refresh rate and NVIDIA G-Sync technology built-in for a smoother gaming experience. Connect it to your system via HDMI or DisplayPort and adjust it to your preferred viewing position with the included stand.